From industry insights to news stories on the latest trends in PR, comms and marketing, PRWeek covers it all. 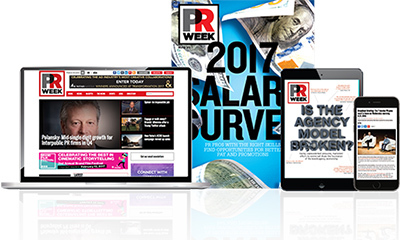 Subscribe to PRWeek to get the latest news, industry views and in-depth analysis available across all platforms. Plus, benefits include full unlimited access to prweek.com, subscriber-only newsletters , archives, discounts to exclusive events, webcasts, special reports and much more. Subscribe today and be a part of the PRWeek global community.